Published by the American Geophysical Union as part of the Geophysical Monograph Series, Volume 113. This volume offers a sample of the diversity of research on faults and fluid flow in the late 1990s. It describes detailed surface and subsurface characterization of fault-zone structure and diagenesis with implications for hydrology and petroleum geology; the role of faults in geothermal systems; laboratory studies of rock mechanics, permeability, and geochemistry of faults and fault rocks; and mathematical modeling of fluid flow through faulted and fractured rocks. The most striking and appealing feature of the volume, as well as the general research topic of faults and subsurface fluid flow, is its interdiscplinary nature. The authors are drawn from the fields of structural geology, engineering geology, geohydrology and hydrogeology, sedimentology, petroleum geology, geothermal geology, rock mechanics, and geochemistry. Likewise, the emphasis on faults rather than simple open fractures raises issues not addressed in much of the literature on flow through fractured rocks. Although faults are a type of fracture and semantics can confuse the issue, faults are generally more complicated than the simple fractures that are the focus of most work in fractured rock hydrology. Most notably, faults can have very large displacements (up to many kilometers) and develop complicated tectonic fabrics, gouge zones, and juxtaposition of rocks or sediments of different types. 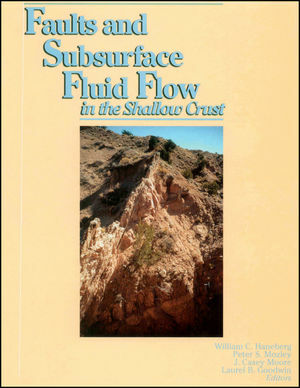 William C. Haneberg and Peter S. Mozley are the authors of Faults and Subsurface Fluid Flow in the Shallow Crust, published by Wiley.